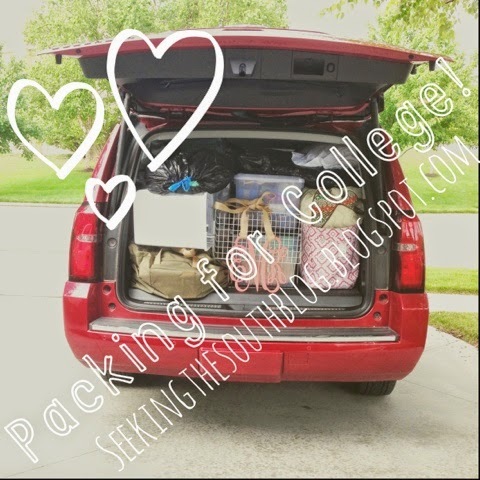 How to Efficiently Pack for College! You would think the Pins I’ve accumulated on how to pack for college would help me prepare better for the move from Kansas to Texas. Nope. I had all of my clothes spewed across my room, decorations taking over the basement and everything else spread out in between. I hadn’t even thought about actual school supplies until a couple of days ago. But after spending all day yesterday packing, I hope a few of my tips will help someone be a little more prepared than I was. Also, huge shoutout to both of my parents for packing and moving a lot of my stuff! My brother, too. Y’all rock!!! The first tip I have actually comes from one of my mom’s friends. We bought one of those 8-drawer plastic carts from Michael’s but you can honestly find it at Target, Walmart, Home Depot or wherever. But it was on sale at Michael’s and we love using Michael’s weekly coupons so it was a very good price. Since my bed will be halfway lofted, this will hopefully fit under it (fingers crossed). This cart is perfect for things I don’t want to take up room in my closet but I still need access to. The top drawer has a plastic organizer in it and I plan to use it for non-essential makeup items such as palates and lipsticks. The next is for jewelry. 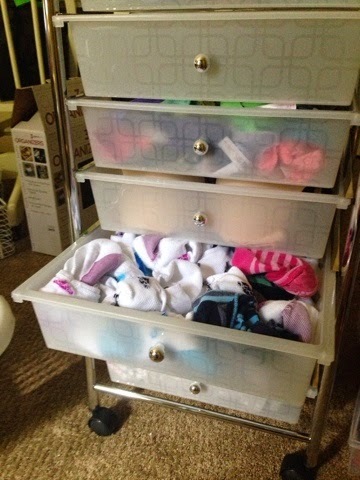 The following drawers are underwear, bras, socks, sports bras, pj pants/fuzzy socks (obviously a dorm essential right?!) and swimsuits. But the best part about this system is that instead of packing a big, bulky, empty cabinet, I kept it filled and used press-n-seel wrap to wrap the entire cart. 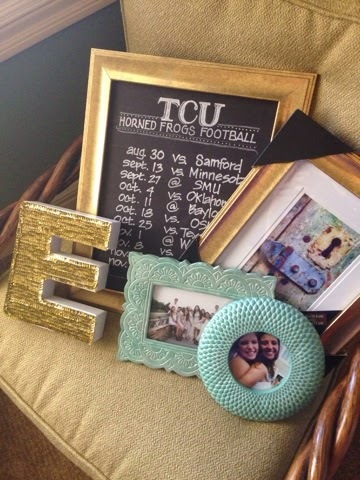 This way I can simply roll it into my dorm and unwrap and I have everything I need, already organized. 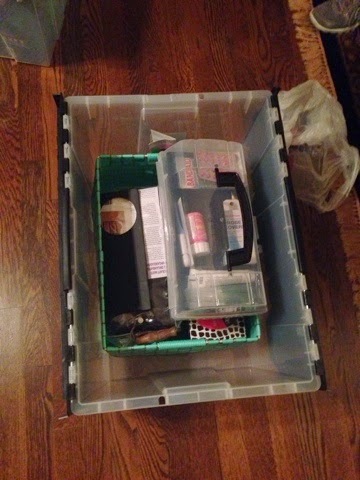 The next packing tip is packing bins in boxes. I actually found this one on Pinterest. 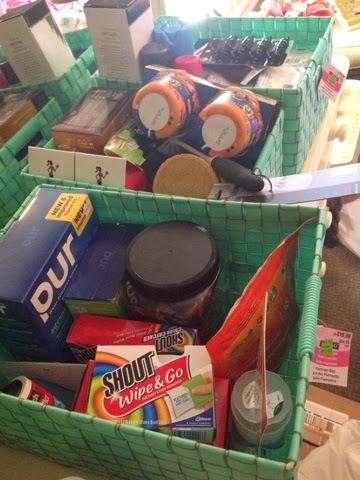 We put items in the bins I plan to keep in the dorm with their similar items and packed those bins in bigger bins. This is not only easy to pack, but even easier to unpack. 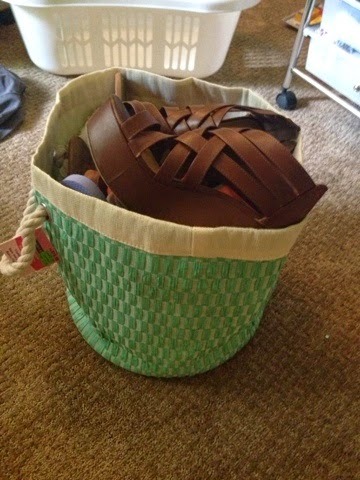 I had bins for laundry items, bathroom items, necessities such as light bulbs and so on. 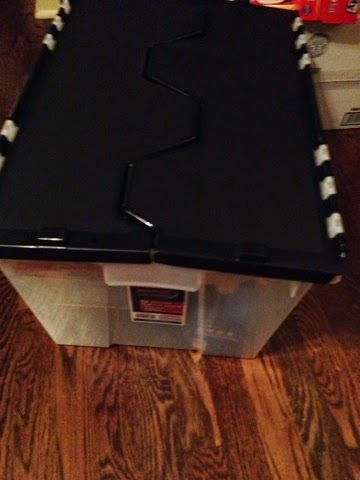 These bins were then put in large plastic bins that we found at Costco in a three pack. If you’re anything like me, you’ll need a full bin for food/kitchen items. (Yes 12 Spongebob Mac n Cheeses were necessary). 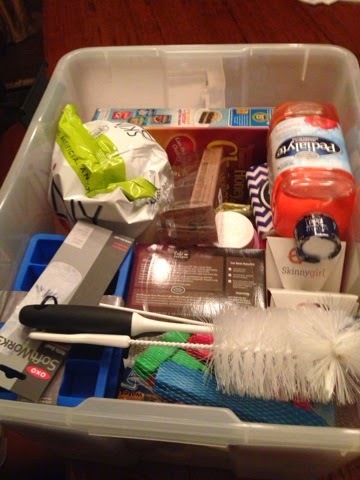 We filled this bin with not only food but chip clips, ice trays, dish brushes, etc. 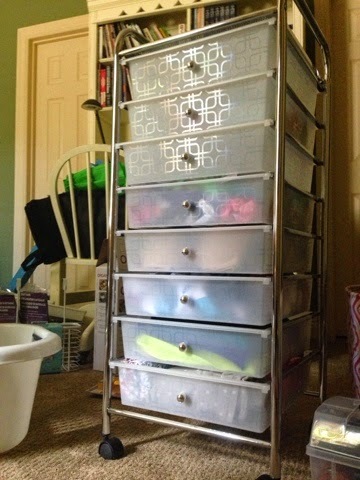 Next is shoe storage. 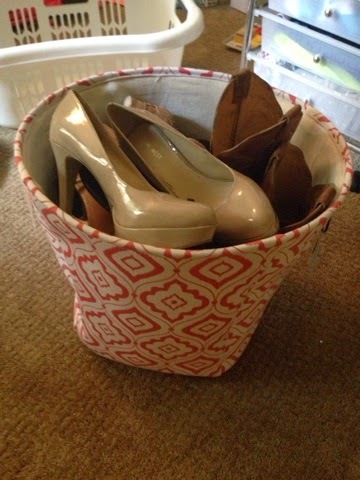 Somehow I managed to fit all of my shoes into these two adorable cloth bins. The coral one is from HomeGoods but I can’t remember where the teal one is from. Packing my shoes in these means less boxes, and I can just put them in my dorm without unpacking anything. My next tip is literally a lifesaver. If you’ve ever moved you’ve probably used God’s great creation: SpaceSavers. Considering the last time I moved I was 8, I don’t think these bad boys were even invented. However, I have learned to love their power. 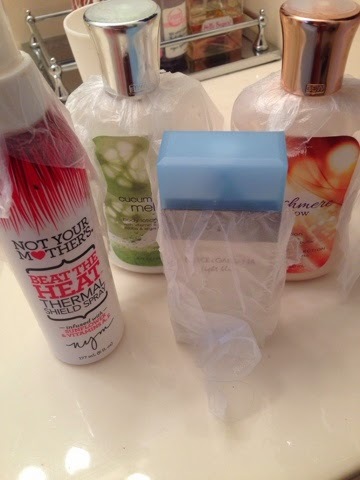 We used Ziplock’s version but they all do the same thing: save enormous amounts of room. 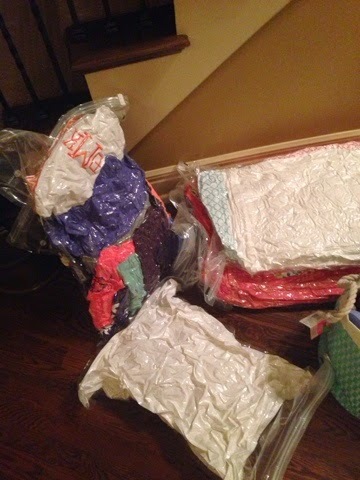 The only problem with these is that whatever goes in them will wrinkle so only put unimportant, bulky items in them. We packed my towels, towel wrap, pillow, quilt, sheets, tee shirts, sweatpants, sweatshirts, jackets, athletic shorts, yoga pants and leggings all in the few bags shown above. Amazing stuff. My dad is a smart man. Knowing my decorations are precious to me he wanted to make sure they didn’t break in the moving process. Luckily, my ottomans (one will be for my roommate) have a lot of storage in them so we decided to put breakables such as picture frames, lights, etc. in them. They for great and I won’t be worrying about any shattered glass in the car. One thing I was nervous about was my beauty products spilling in my suitcase that was also home to numerous clothing items. Thanks to Pinterest (gah I love you) I found a tip that suggests putting press-n-seal wrap under the lid then sealing the lid tight to ensure no leakage. I then put these bottles in a large Ziplock just to be safe! That’s about all I have as of now, but I really hope this helped someone out! 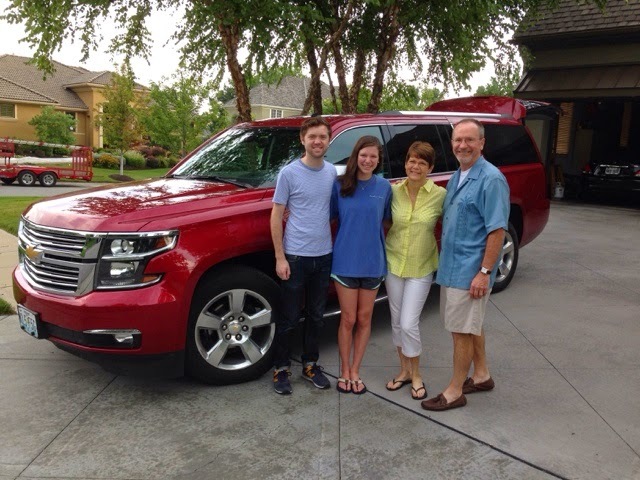 We’re all loaded up and on the road! See you soon, Texas!! Previous Post Recruitment Is Near!